Publisher's Note: As a monthly publication, the articles by Reps. Blackburn & Cooper were written before the House renewed its push for a vote on a revamped AHCA plan. Rep. Blackburn voted in favor of the new measure. Rep. Cooper voted against. While the bill passed in the House 217-213, it is far from a 'done deal.' The Senate now takes up the measure and has promised significant changes ... with some Republican lawmakers saying they will scrap the House version and start over. Changes to the AHCA will require the bill go back to the House ... and we begin again. We share this to say that the thoughts and remarks of our two esteemed guest columnists are still relevant and timely with healthcare reform an ongoing conversation. Don't give up on reforming our healthcare system! Readers of Nashville Medical News are certainly tempted to think about something else. You are busy taking care of today's patients. You are frustrated with the bumbling efforts at the national and state level to "improve" care for tomorrow's patients. You have seen past reform efforts backfire, adding more complexity, bureaucracy, and anxiety to your lives. In fact, it is hard to understand what those "reformers" were even trying to achieve. The reality, however, is that you need to be at the table to avoid being on the menu. Reform is going to happen with or without you, so you might as well put in your two cents. Have lunch or be lunch. Reform is not just for young people. Even physicians, nurses, and other providers who are thinking of retiring need to realize that they still have much to lose by not speaking out. You also have much to gain by helping others learn from your years of experience. Retirees have even more to offer because they have the time to think deeply about these issues. Nashville is a healthcare capital in so many ways, but we have not led the policy debates, as we should. Most congressional and state legislative policies have been decided without us, rather than shaped by us. Readers of Nashville Medical News provide some of the best care in the world, but we have not been given the respect that such high-quality providers deserve. Whether you love or hate Obamacare, there is a place for you in the policy debates. Whether you want to expand Medicaid in Tennessee or not, we need your voice. Any federal or state legislator who does not know who you are and what you do for a living -- and how well you do it -- will not be able to represent your views. Even better, physician, nurse, and provider groups should get together to make unified recommendations to lawmakers. Professional groups and trade associations often do this regarding reimbursement and liability issues, but they get quiet about broader issues. Just so you know where I have stood in the past, I have supported bipartisan, market-oriented alternatives to Clintoncare, Obamacare, and now Trumpcare. I have always believed that access to medical care is such a personal, urgent need that the last thing patients should have to worry about is politics. I care so much about health reform that I have taught MBA students at Vanderbilt's Owen School of Management for 20 years. This year I was once again invited to speak to Vanderbilt's medical school. I am a Democrat who is a strong supporter of Republican Governor Haslam's "Insure Tennessee" plan. His plan to expand Medicaid in our state has not even been voted on in the Tennessee General Assembly after three years of waiting. His plan deserves a vote. We deserve to know where our state lawmakers stand. And our citizens deserve that medical care. Obamacare is working much better than most Republican partisans believe, but it needs many fixes. Our Republican colleagues should stop trying to repeal Obamacare and start trying to help fix it. Republican failure to pass their own, hastily-drafted AHCA in March highlighted the absence of a real alternative to Obamacare despite seven years of complaints, as well as the many problems with the box of policy Band-Aids they were offering. I mention these things, not to foreclose debate, but to open a discussion. I learn something every day and am not too proud to admit it. Recently, I even cosponsored a Medicare-for-All bill because I have become so frustrated with the behavior of our so-called "private" health insurance companies. I have long been frustrated by our pharmaceutical companies. The prescription drug ads that are all over television undermine physician authority and cost billions of dollars that would be better spent on health research. As President Trump said a few weeks ago, "Who knew that healthcare was so complicated?" You and I know, and I hope you are as interested as I am in improving it. Wouldn't it be nice to simplify it? Please contact me if you would like to have a serious, informed policy discussion so that I can benefit from your experience and you can benefit from mine. Together, we can improve healthcare in America. 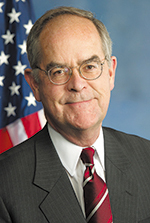 U.S. Rep. Jim Cooper (D-TN 5th District) represents constituents in Davidson, Cheatham and Dickson counties. A Nashville businessman, attorney and part-time Vanderbilt professor, Cooper has more than 25 years of experience representing Middle Tennesseans in D.C. He is widely known for his work on the federal budget, healthcare and government reform, and his ability to reach across the aisle on bipartisan issues. For more information or to connect with Rep. Cooper, go to cooper.house.gov.